Lockstep positioning of this kind is more shaky these days. In February of this year, when the news leaked out about New York City Mayor Bill de Blasio’s off-the-record assurances to AIPAC that part of his “job description is to be a defender of Israel” and that “City Hall will always be open to AIPAC,” he had to face down the public wrath of the city’s progressive Jewish communities. The wind has shifted, to say the least, for which we can thank the architects of the BDS campaign. Their non-violent call for solidarity, issuing from within Palestinian civil society, and enjoying the support of all Palestinian trade unions, has profoundly altered the landscape in recent years. Because it promotes private economic actions, the campaign entirely circumvents the grisly stalemate of state-to-state diplomacy (a Bermuda Triangle between Washington-Jerusalem-Ramallah) that has allowed Israel’s expansion to proceed unchecked. In Europe, Africa, and Latin America, responses to the BDS call now stretch all the way from grassroots groups to government-backed initiatives and national congresses of organized labor. Even in the U.S., a state that is almost as isolated from international opinion as Israel itself, the wall of denial is crumbling. Permission to speak and act publicly in solidarity with the Palestinian cause comes more easily, though it seldom escapes the ever-vigilant notice of those determined to shore up the wall. The recent ugly backlash against the American Studies Association’s (ASA) decision to join the boycott of Israeli universities should have surprised no one. Less predictable was the widespread mobilization against the backlash, which has included individuals and organizations (like the American Association of University Professors and the ACLU) that were opposed to the boycott itself. In the New York State legislature, a bill aimed at penalizing ASA membership (I am an ASA member) was pulled even before it moved out of committee. This was almost unprecedented for legislation sponsored by the Speaker of the State Assembly, and it was the result of multilateral pressure from an ad hoc coalition of professional associations, NGOs, academics, and trade unions that delivered a rare defeat for the pro-Israel lobby pushing the bill. Copycat legislation, some of it patently unconstitutional, has failed in other states (i.e., Illinois and Maryland). Of course, the backlash is far from over. The tactics of intimidation and thuggery deployed by some organized supporters of Israeli policy should remind us of the military violence at the heart of the colonial occupation in Palestine. Indeed, that is the unspoken intention behind these threats. Somewhere behind all of the bullying and verbal posturing lies the metallic decree of armed force. The case for joining BDS rests on reasons of law, solidarity, and justice, and I will summarize these in turn. But first let us acknowledge the absolute centrality, for labor, of the boycott as a tactic. The name itself comes from an 1880 work stoppage of Irish tenant farmers against the usurious practices of a British land agent called Charles Boycott, though, in practice, all withdrawals of labor have been principled boycotts in their own way, just as consumer boycotts of targeted employers have been sympathy strikes in all but name. The American Revolution originated in a boycott of British tea ships, and many of our more auspicious moments of progressive solidarity turn on similar acts of refusal—the abolitionist boycott of slave-labor products such as sugar, indigo, rice, and cotton, the AFL’s anti-Nazi boycott of the 1930s, the Montgomery bus boycott that elevated the civil rights movement, the Farm Workers Grape Boycott of 1965, and the Nike boycott campaign that drove the early anti-sweatshop movement. Like those who opposed the anti-apartheid boycotts, BDS’s adversaries are on the wrong side of history. They are also on the wrong side of the law. The case for BDS is rooted in decades of illegal settlement-building and Israel’s equally long record of flouting international law. The blockade of Gaza, the annexation of land, the erection of separation barriers, and the policies of ethnic cleansing are among the many violations of the Fourth Geneva Convention prohibiting the collective punishment of civilians and requiring an occupying power to ensure access to food, medical supplies, and public health facilities. Israel’s formal system of legalized discrimination against Palestinian Arabs meets the UN definition of apartheid, and its deep alteration of local laws within the occupied territories violates Hague Convention regulations. With respect to the three billion dollars of U.S. aid (more than $118 billion in total, most of it in military aid, and far outstripping the sums allocated to other, more needy recipients) that flows to Israel every year, the many acts of IDF aggression, including home demolition, are in violation of the Arms Export Control Act, which prohibits the use of U.S. weapons and military aid against civilians. Add to these the roster of Israeli laws, permitting the “administrative detention” of Palestinians, that are violations of the International Covenant on Civil and Political Rights (ICCPR) which prohibits arbitrary detention and requires that detainees have the right of habeas corpus. At a very basic level, the BDS campaign is asking us to end our complicity with companies and institutions that profit from, or promote, Israel’s bluntly illegal conduct. But legality, which does not always equate to justice, is hardly the ultimate yardstick, as labor history can attest. Many of labor’s greatest wins, after all, were achieved by disregarding or challenging laws that were clearly unjust. Solidarity is an alternative, and often superior, principle for action. That is why trade unionists all across the world have responded to calls from their Palestinian counterparts over the years. Dockworkers in Sweden, India, Greece, South Africa, Turkey, and California refused to offload containers after the war on Gaza in 2008 and the Israeli naval assault on the Gaza Freedom Flotilla in 2010. Dozens of individual unions and national congresses of unions (in Spain, Norway, Ireland, Scotland, France, Canada, UK, and Brazil) have endorsed BDS, or severed relations with the Israeli labor federation Histadrut for its backing of punitive wars and territorial expansionism. No one should be unmindful that expressions of international solidarity from within the US are seldom straightforward. The legacy of the AFL-CIO’s cozy involvement in Cold War geopolitics continues to complicate efforts to organize globally, or even to establish diplomatic relationships with ostensibly Communist congresses like the All-China Federation of Trade Unions. It has been a long struggle for the AFL-CIO to distance itself from State Department policy in many regions of the world, and its conformity on Israel feels like a disturbing residue of its former pact with Washington. All the more reason to cut those ties and accept the Palestinian invitation to take action against the profiteers and enablers of the occupation. 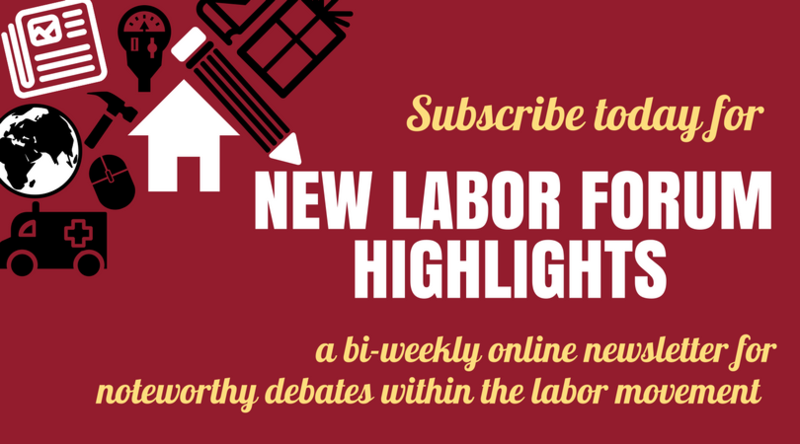 It’s not only the right side to be on, it also honors the progressive Jewish tradition that sustained so much of American (and Israeli) labor history. Israel, or the overall BDS prescription for change, is the correct response—not for the labor movement, nor for other movements or individuals. The current Israeli government is a right-wing government with a smattering of centrist parties devolved from a very complex—and partly dysfunctional—parliamentary system. I don’t support it. But boycotting this government will only make it stronger. That’s because the tendency inside Israel—and especially on the right—is to hunker down in response to boycotts. Poll numbers rise for the right when there are visible attacks on Israel, and savvy politicians—especially Israel’s Prime Minister—make ample use of these opportunities to strengthen their own base at the expense of the left. Boycotts dry up the peace camp and make the occupation faceless to the majority of Israelis because the combination of hunkering down internally and the inability to engage with Palestinians and non-Israelis who support two states puts the peace camp on the defensive. Israelis want to be assured that there is a partner for peace. The Israeli left needs and wants two-state advocates to come to Israel, to speak out and to engage. It’s easy to go on with daily life in Israel and not experience the occupation unless you are a settler or a solider. That’s one of the consequences of the separation wall that was constructed by Israel. Trade union delegations coming to Israel and speaking out to the Israeli public would be important, especially now, with the situation appearing so grim on the negotiating front. Boycotts are an annoyance for the Israeli economy and for politicians, but they have little real impact on changing the status quo on the ground. If the goal of the BDS movement is to end the occupation on the West Bank and free flow to Gaza, this goal will not be achieved via boycotts of Israel. The only realistic resolution to a seemingly intractable situation is still two states for two peoples, as stated in the Geneva Accords. This statement was signed by leading Palestinians like Qadura Fares (a close ally of imprisoned Palestinian leader Marwan Barghouti and the head of the NGO that supports Palestinian prisoners and their families) and Yasser Abed Rabbo, a Fatah leader, and is considered a guide for any final settlement agreement that would be fair to both sides including dividing Jerusalem and resolving the refugee claims while signifying an end to conflict. The BDS campaign obfuscates the difficult issues that do exist regarding Israel’s shameful occupation of the West Bank and the need to achieve a two-state solution. By labeling Israel an “apartheid state,” which they do in all of their literature, BDS activists make no distinction between the occupied territories and the 1949 Armistice Line, known internationally as the “Green Line,” between Israel and the West Bank. This is the basis for a border of a future Palestinian state, the internationally recognized 1949 armistice agreement. Why do BDS activists intentionally blur Israeli society with the issue of the occupation of the West Bank? Do they want to delegitimize Israel as it exists today? Do they want to create a bi-national state where Jews and Arabs—Muslim and Christian—all live side by side in peace? That’s a terrific utopian dream, but at a time when even Scotland is threatening to secede from the United Kingdom, it doesn’t seem practical or realistic. Moreover, the BDS activists who argue that the Palestinians are the ‘indigenous people” in the area negate the right of the Jewish people to a nation state. How can there be a bi-national state when only one people’s rights are recognized? It appears as if BDS is not a tool for ending the occupation, but rather a tactic to end the state of Israel. Anyone who visits Israel—which the BDS activists refuse to do—can see a complex situation. Arab citizens of Israel are discriminated against—in employment, allocation of educational resources, housing, land distribution, and planning rights. But this situation has changed immensely, especially in the last decade, often due to activists in the non-profit sector, both Jewish and Arab Palestinian citizens of Israel. Discrimination is vigilantly challenged by many lawyers in Israel, Jewish and Arab. The Supreme Court and the Attorney General have even ruled against right-wing politicians who seek to press discriminatory policies. Such xenophobic attitudes, marked by racism, must be confronted. These efforts should be supported by everyone who wants a better future for all peoples in the region—particularly those who believe in democratic rights. For those who believe in a two-state solution there are strategies that would be far more effective than BDS. I will suggest just two, though there are many more. I believe in boycotting the settlement industries until final borders are drawn, while I support buying products made inside of Israel. I think this is a critical distinction that neither the BDS supporters nor the settlers make. So, I won’t purchase a Soda Stream product until the company moves its facilities. But, I also know that today, it employs 500 Palestinian workers in the settlement of Mishor Adumim who will be out of work, were the factory to close. There is a desperate need to help Palestinians to create businesses that will sustain an economy not dependent on political ebbs and flows from the Gulf States, the US, and the EU in the form of aid. Unions and international union secretariats could work with some of those global employers who are exemplary in business practices to increase their social investment into a future Palestine. Cisco is already there, as is Google, taking advantage of the Palestinian professional tech sector. Unions could encourage their allies to hire there for tech needs. It’s important to bring non-tech global companies there too. There are joint efforts among Israeli, Palestinian, and global business leaders to grow and sustain an independent Palestinian economy, an economy that adheres to fair labor standards and will stave off brain drain, so needed to build a new state. There is a critical role in assisting this effort by the global labor movement through investment and more. Invest, don’t divest. Dig in and engage; there’s plenty to do. The labor movement also can play a tremendous role in supporting efforts to grow the Israeli peace camp at a critical time. The peace camp in Israel is underfunded while the right wing and the settlers have extensive financial backing both from Israel, US donors, and others. Why is the instinct of the American left to walk away instead of supporting those fighting for a different society? And why wouldn’t unions support the social democratic, pro-two state parties inside Israel, as they have historically? Both Meretz and Labor, today in the opposition, have stronger leadership than they have had in years. The peace camp in Israel is under attack by right wing, anti-democratic forces inside Israel and needs financial support. Why not bolster efforts by the Israeli peace camp to directly petition the Supreme Court, which is an effective means in Israel, on behalf of Palestinian landowners against settler land grabs? Right now, activists are doing their best with little funds available. Democracy and freedom of thought are critical to the ethos of trade unionism as they should be. Therefore, support by unions for academic institutions inside of Israel and inside of a future Palestinian state is equally important. It’s specious to attack Israel’s universities where all Israelis, Jews and Arabs, can and do study. For instance, at Israel’s Technion, 17 percent of the students are Palestinian citizens of Israel (20 percent of Israel’s overall population are Arab citizens of Israel). Palestinian universities are graduating top students, even under the strain of military occupation. In the past (before BDS efforts), joint-work lent intellectual support to both communities along with a promise of a different Middle East. The global union movement can facilitate sharing of resources to build a region of freedom by organizing joint programs and projects, especially in the education sphere. Historically unions invested in Israel’s social sector, in housing starts, cooperative efforts, and more. Today, that same initiative could be made to consider investment in peace, in democracy education, in building health centers, and more that will impact change both inside Israel and inside a future Palestine. If, indeed, the goal is to create two states for two peoples, let’s debate together how best to achieve that goal. Time is running out. Jo-Ann Mort makes an impassioned plea for us to shun BDS and make common cause with like-minded Israelis working to advance the peace process. Central to her reasoning are three arguments to which I will respond briefly. A) Supporting the BDS campaign, she contends, is a mode of withdrawal; instead we should be engaging. Yet, for most people, joining a boycott like this one is a proactive step along the road of ever greater participation. Unlike checkbook activism, it is a continuing act of solidarity because it requires vigilant monitoring and updating of current affairs, and it involves us in moral quandaries on a regular basis. Nor is it a step taken lightly, given the fierce intimidation directed against public BDS supporters, especially in the U.S. where the bullying tactics are especially malicious. Progressives who are smeared in this manner are less likely to walk away. Nor does support for BDS in any way require disengagement with progressive Israelis and their causes. This really is a false dichotomy. The academic boycott, for example, targets universities because their institutional policies and practices enable the Occupation; the boycott does not prohibit exchange and shared political work with individual Israeli academics. Supporting the ASA resolution, in my case, has not stopped my conversations with Israeli academics who are proponents of the boycott, and who face legal recrimination under Israeli law for their views. B) Mort believes we should distinguish between the settlement industries and those inside “Israel proper,” confining the boycott to the former. This ignores the fact that the settlements, which now control 42.7 percent of the West Bank (UN figures) are a direct product of Israeli state policy. They are colonies and not rogue outposts, populated by rugged ex-urbanites or maverick entrepreneurs who buck the state’s efforts to rein them in. The whole point of settler colonialism is to enlarge the occupying state through appropriation of land. The boundary between what lies inside and what falls outside is constantly being shifted by the colonizing force, and, in the case of Palestine, the ability to expand with impunity depends directly on the power of institutions inside Israel; military, commercial, financial, academic, in addition to other organizations that are arms of the state in all but name. C) Last but not least, is Mort’s argument that BDS is a veiled attempt to delegitimize Israel itself. This has become a commonplace of the publicity machine that depicts Palestinians as fundamentally deceptive (not to mention violent and subhuman), and it repackages the older, alarmist rhetoric about Israelis being driven into the sea. Let’s not allow this imagined threat to Israel’s “right to exist” divert attention away from actual Palestinian suffering—from the evictions, segregation barriers, demolitions, blockades, detentions, ethnic cleansing, and other daily deprivations. Joining the BDS campaign is first and foremost about affirming the struggle of Palestinian people to exist. The only real question about legitimacy here is why the illegality of Israel’s policies has been tolerated for so long. Andrew Ross makes a good point about the historic role—and moral imperative—of boycott movements. But, his target is the wrong one. This is not about taking on AIPAC or any other US organization for that matter. Nor is it—or can it be—simply about taking a stand. There is no simple historic precedent for this. The situation is too urgent for symbolic gestures and the stakes are too high. Justice for both peoples is urgent. That’s why progressives must consider the most tactical, and moral, tools to end the occupation and then help build a Palestinian state with a robust and fair economy. Further, it’s vital to get the facts correct. The Histadrut, Israel’s trade union federation, does not support “territorial expansion,” as Ross writes. It has never supported Netanyahu. In fact, it has sought—and continues to seek—cooperation with the PGFTU, the Palestinian General Federation of Trade Unions. It has played a public and private role in seeking wages for Palestinian workers in the occupation (including successfully petitioning the Israeli Supreme Court on behalf of Palestinian workers in the occupied territories), securing travel access and safe passage for trade unionists from Gaza to the West Bank, and advocating for a two-state solution. Its leadership does not support the current Israeli right-wing government which, by the way, is also promoting a privatizing economic policy anathema to workers. On the contrary, the Histadrut recently played an important private and pronounced public role in strengthening the leadership within Israel’s Labor Party to ensure a new leadership team that includes social democratic economic policies side by side with a strong position supporting two states, justice for the Palestinians and engagement with the Arab Peace Initiative. The role of the ICFTU has been critical to these pro-worker (Israeli and Palestinian) efforts, in spite of actions taken toward BDS by individual unions in various countries. It is imperative that international union efforts emphasize strengthening partnership efforts, not diminishing worker power through efforts that silence workers’ voices on either side. Also, as I write this, a unity agreement between Hamas and Fatah has been signed (which I believe is an important step toward promoting peace and two states). However, if the Fatah-Hamas truce holds, it will be vital that pro-worker forces monitor Hamas for union violations. They have no history of support for freedom of expression of any kind within their own community, including rights of women, the GLBT community, or workers who support Fatah who were purged from their positions after Hamas took over. Finally, as I stated previously, but it needs restating, it is not factual to state that there is “legalized discrimination” that “meets the UN definition of apartheid,” within the parameters of the 1949 Armistice line borders of Israel (the “Green Line”). There is a heinous military occupation of the West Bank and the Gaza border that must be eradicated, not simply so that Israel complies with international law, but so that both peoples have a chance for more just lives. Jo-Ann Mort is a strategist working with non-profits, philanthropists, and the private sector in the US, Israel, and the Palestinian Authority area. She writes frequently about Israel and Palestine and is co-author of Our Hearts Invented a Place: Can Kibbutzim Survive in Today’s Israel? published by Cornell UP. For thirteen years, she was director of communications for ACTWU and UNITE, the garment and textile unions. kes a good point about the historic role—and moral imperative—of boycott movements. But, his target is the wrong one. This is not about taking on AIPAC or any other US organization for that matter. Nor is it—or can it be—simply about taking a stand. There is no simple historic precedent for this. The situation is too urgent for symbolic gestures and the stakes are too high. Justice for both peoples is urgent. That’s why progressives must consider the most tactical, and moral, tools to end the occupation and then help build a Palestinian state with a robust and fair economy.